This entry was posted in General on April 28, 2016 by Web Admin. On March 10, Signature Healthcare of Bremen hosted the wedding of Linda Jones, an occupational therapist at Bremen, and Jerry Lairson. Linda asked one of our residents, Joy Johnson, to be the mother-of-the bride for the day. Linda and Joy have an incredible bond. Joy accepted the honor and insisted on giving away the bride! 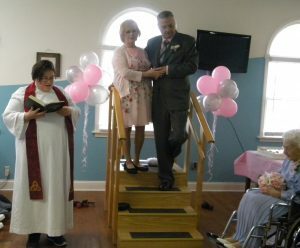 Joy has worked hard in therapy so she would be able to stand for the wedding pictures. Over 40 residents joined us in the therapy gym and lined the hallways in celebration of the joyful day. To quote one of our residents “break out my Sunday best, I’m going to a wedding!” ​We were honored that Linda and Jerry shared this beautiful day with us. 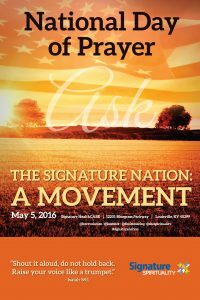 This entry was posted in General on April 17, 2016 by SHC Spirituality. 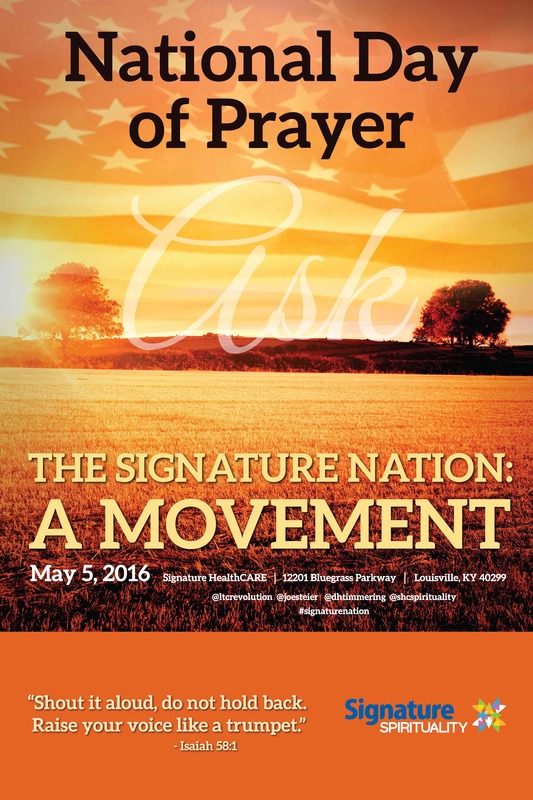 National Day of Prayer Poster Unveiled! Posters are in the mail to facilities today! This entry was posted in General on April 7, 2016 by SHC Spirituality. The Compassion Fund continues to assist in amazing ways and the needs are growing. When you shop remember the generosity of our partners AmazonSmile and your neighborhood Krogers. AmazonSmile is a website operated by Amazon that lets customers purchase the same selection of products at the same price, but the AmazonSmile Foundation donates a 0.5% of the price to The Compassion Fund each time you shop with them. If you have an existing Amazon account, you can use the same account and link it to The Compassion Fund here. It costs you nothing! You can also go to AmazonSmile.com then select AmazonSmile and select The Compassion Fund as your preferred charitable organization. You only have to select us once and every time you log in to Amazon, the site will remind you to check out using AmazonSmile. 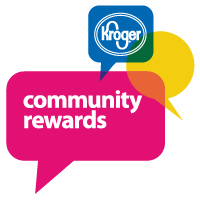 Many of you might be familiar with the Kroger Community Rewards Program, which is similar to the AmazonSmile program. You can register your Kroger Plus Card here to begin making the same type of donation each time you use your card. There is no cost to you, and it will help us raise funds to provide assistance and alleviate suffering of our stakeholders, residents and our community members. So, all year-round, in addition to donating via your paycheck, you can also shop compassionately just by patronizing our partners for your everyday needs. Feel free to share this information with your friends and families as well. We thank you for helping us fulfill needs of those around us. This entry was posted in General on March 24, 2016 by SHC Spirituality. Tonight at sunset begins the Jewish holiday of Purim which continues through tomorrow evening at sunset. Purim is the Jewish holiday of Purim which commemorates the deliverance of the Jewish people in the ancient Persian Empire from destruction in the wake of a plot by Haman – a story recorded in the Biblical Book of Esther. According to the Book of Esther, Haman, royal vizier to King Ahasuerus planned to kill the Jews, but his plans were foiled by Mordecai and Queen Esther. The day of deliverance became a day of feasting and rejoicing. Purim is characterized by public recitation, usually in synagogue, of the Book of Esther (known as k’riat megillah). In addition to this there are additions to the regularly said prayers and the grace after meals, the giving of mutual gifts of food and drink, giving charity to the poor, and a celebratory meal. Other customs include drinking wine, wearing of masks and costumes, and public celebration. Like Hanukkah, Purim has more of a national than a religious character, and its status as a holiday is on a lesser level than those days ordained holy by the Torah. Accordingly, business transactions and even manual labor are allowed on Purim. This entry was posted in General on March 23, 2016 by SHC Spirituality. This entry was posted in General on March 18, 2016 by SHC Spirituality. This entry was posted in General on March 17, 2016 by SHC Spirituality. I recently came across this conversation with my mom in January 2012 which I had written down at the time, just after she had passed away in one of our SNFs. I wrote it down to capture her voice. The white page with black ink breathes her immortality and is a true treasure to me. Just like a buried light, it gifts me with her memory and I feel her presence, alive and well. January 9, 2012 – Had a good conversation with mom today . . . I told her sorry that she had fallen and broke her ribs, that convalescing was tough; from there we may have discussed the rottenness of the disease [for she had Parkinson’s]. I just don’t know. “Hello precious girl,” she said. She reached out to hug me. I’m so glad she did. “It is good being with you,” I said. “It is good to see you,” she whispered. “You look beautiful,” I said. “Look at that pretty face,” she said to me. And then she admonished. “Fix your hair.” (She was always saying that). Mom told me just how proud she was of me. It meant so much. I prayed in God’s name and by His stripes she was healed across her body. . .
We studied each other twice like she had so much to tell me so I said, “there is so much going on in that head of yours which you just can’t say.” She knew . . . maybe she just knew. “You’re the best mommy in the world,” I say, because she could barely speak. “I love you,” she said with a deep guttural breath, like the gulp couldn’t get out of her way. Why didn’t I take the time to lie down with her that Friday? Can I forgive myself? “Hi precious,” she would respond. “Trust Me fully,” God says. The vacancy in her eyes – so much to say, or nothing, or just peace, like her voice and thoughts couldn’t connect anymore. I can’t pocket away the grief. I can’t put it in a closet. I can’t do anything with it. But God knew. Together the 3 of us, dad, my sister, and I assembled the most amazing and beautiful package of love – dad doing his role, Linda hers, and me mine. Not one did more or less. We just did as God orchestrated from above. But God then who was she calling? (She passed with the phone in her hand). I don’t think she wanted to die. Did we give her up too soon? I picked my home over visiting my mom too many times, or was it just rest after a long day? I wish I could look upon her again-her sculpted face and red cherry hair. Why didn’t I know she wanted grapefruit and oranges . . . I could have brought her some. . . The grief I suppose takes one day at a time to process and God sweeps it away behind us as we release it to a new ecosystem of life and survival. Hi Mommy. . .Hi Mommy, Hi Di . . .
She could reach out and touch my face because she could see it; I hope it was a light to her. I hope she knew how much I loved her. This entry was posted in General on October 29, 2015 by SHC Spirituality. Signature Spirituality has been recognized by McKnight’s with an Excellence in Technology Award for its use of the STracker system to document chaplain interactions and improve care and services with regard to spirituality, as well as how spirituality interfaces with other disciplines. Read more about STracker below. What is the STracker System? STracker is a technological innovation that is a SharePoint-based tracking system that is a shortened combination of the words (“spirituality tracker”). This system is designed to provide a universally accessible system of online reporting for the encounters that chaplains have week-to-week with residents and other individuals or groups (stakeholders, family and community members). The system was developed with the intent of both tracking the inputs of chaplain care as well as directing chaplain services towards vital areas of need within a given facility. How often are reports generated? 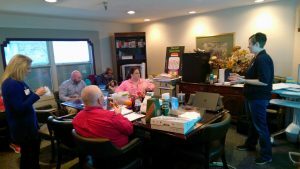 Reports are pulled from the system weekly and sent to all chaplains, administrators, regional vice-presidents as well as to senior team members. What were specific benefits that were derived from this effort? The Stracker system and it’s quick-turnaround reporting allow for chaplain care inputs to be captured and reported in a short time frame giving feedback to chaplains and facility partners on their work. The system allows chaplains to better target their efforts particularly with regards to certain issues over time, so as to apply greater efforts where needed. Who assisted in this effort? The Stracker system was designed by the Signature Spirituality department in collaboration with the in-house Signature Information Technology Team. The line items and organizational structure of the system was laid out by the Spirituality Team where the SharePoint system programming, reporting modules creation and access point coordination with the field were all created by the Information Technology Team. This entry was posted in General on October 2, 2015 by Signature HealthCARE. Today is the observance of Labor Day is the United States, a federal holiday that occurs on the first Monday in September and which celebrates the building of a nation upon the prospect of achievement and the contributions of the efforts of so many to create an engine of prosperity that has been enjoyed by so many. The first big Labor Day in the United States was observed on September 5, 1882, by the Central Labor Union of New York. It was first proposed by Peter J. McGuire of the American Federation of Labor in May 1882, after witnessing the annual labor festival held in Toronto, Canada. By the time it became a federal holiday in 1894, thirty states officially celebrated Labor Day. Following the deaths of a number of workers at the hands of the U.S. military and U.S. Marshals during the Pullman Strike, President Grover Cleveland reconciled with the labor movement. Fearing further conflict, legislation making Labor Day a national holiday was rushed through Congress unanimously and signed into law a mere six days after the end of the strike. The September date was chosen by the CLU of New York and observed by many of the nation’s trade unions. All U.S. states, the District of Columbia, and the territories have made it a statutory holiday. Labor Day has come to be celebrated by most Americans as the symbolic end of the summer. In many social circles, Labor Day is often considered the last day of the year when it is fashionable to wear white. This entry was posted in General on September 7, 2015 by Stephen Bowling.